An insightful exploration of the historical and social stimuli and implications of civil disobedience, City of Protest offers a compelling look at the often-fraught relationship between politics and belonging, and a city’s struggle to assert itself. From the turbulent 1960s until today, Hong Kong has been a city shaped by civil disobedience. The latest wave of protests in Hong Kong’s long history of public dissent culminated in the Occupy Central movement of 2014. What emerges from these grassroots movements is a unique Hong Kong identity, one shaped neither by Britain nor China. An insightful exploration of the historical and social stimuli and implications of civil disobedience, City of Protest offers a compelling look at the often-fraught relationship between politics and belonging, and a city’s struggle to assert itself. 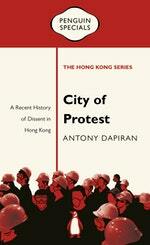 Love City of Protest: A Recent History of Dissent in Hong Kong: Penguin Specials? Subscribe to Read More to find out about similar books.